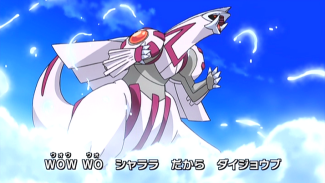 Japanese Opening Theme DP 03: "The Best Everyday!" American Equivalent(s): "We Will Carry On"
A close up of a red eye zooms out to reveal Hou'ou as if flies through the sky. Satoshi runs behind it. 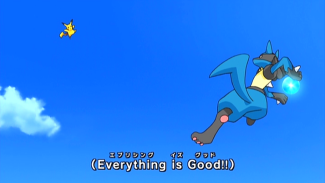 After the title screen, Satoshi's pokemon fight above a stadium; first is Goukazaru vs. Entei, then Buoysel vs. Darkrai, and, finally, Pikachu vs. Lucario. 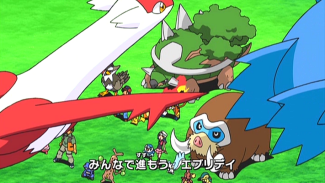 Takeshi's Gureggru is seen briefly before Hikari's pokemon are showcased. Potchama and Pachirisu, Mammoo and Hinoarashi, and Mimirol and Togekiss all appear out of Capsule Balls in pairs. Hikari's Contest rivals are then shown in one long pan shot. 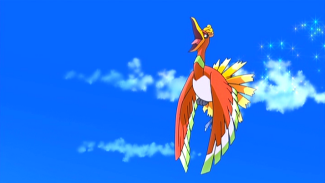 Later, Takeshi looks up and sees some legendary pokemon flying overhead. Elsewhere, Musashi, Kojirou, and Nyasu are fishing on the top of their Koiking sub when a massive pillar of water blasts the trio away. 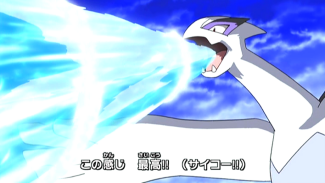 The cause of the pillar, we discover, is Kyogre jumping out to do battle with Lugia. Groudon bursts out of the ground and joins the fight. 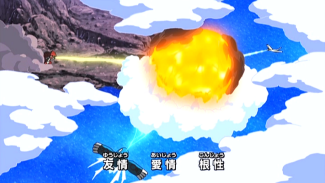 Above, the Rocket-Dan is floating in space as a number of legendary pokemon fly past them. 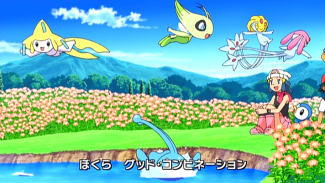 Below, Satoshi and his friends are sitting in a field of pink flowers as the smaller legendary pokemon fly around them. 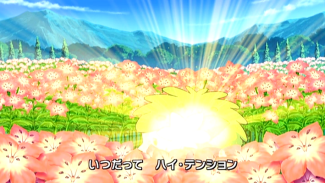 Shami begins to glow and transforms into its Sky Forme. 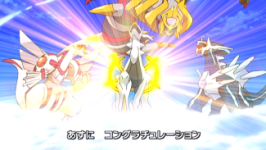 In the clouds above, Dialga, Palkia, and Giratina emerge and pose with Arceus. Fullscreen shots of all of Satoshi's Shin'ou pokemon are shown, followed by individual shots of Shinji and Satoshi glaring at each other in a stadium. 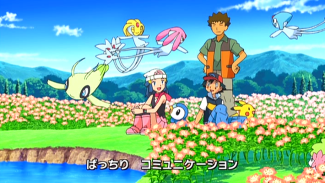 The opening ends with the Shinji, Jun, Naoshi, and Kouhei on one side while Satoshi, Hikari, Takeshi, and all of Satoshi's pokemon stand on the other. The final ending theme of a series has a lot of things to do. It has to showcase all of the major characters of the series, include appearances by all the pokemon who will play an important role, and basically give an overall sense that the ending of this particular series is going to be better than all the others. As much as I hate relying on a term that is used far too liberally on the Internet these days, the opening has to be epic. I think Saikoh Everyday! succeeds wonderfully. The opening really gives the ending that epic feeling that it needs. The animation is top-notch, and the scenes, for the most part, flow together very well. There are some problems here and there - Takeshi gets treated rather poorly in this one, and those shots of Gureggru and Hikari look really out of place - but I think the opening succeeds at more or less everything it sets out to do. The song, on the other hand...it's alright, I guess. But, I think I prefer Ready Go! (as overused as it's become) and Spurt! to Saikoh Everyday! I wasn't a huge fan of Akiyoshi Fumie after her work on Together, and this song didn't really do anything to warm me over to her side. The song's melody is pretty catchy and you'll find it stuck in your head after a few listens, so the song is an earworm if nothing else. The English opening theme returns to using a male voice. It kind of amuses me that people in the U.S. expect a male singer for their Pokémon songs when in Japan, the fanbase expects female singers for their Pocket Monsters songs. I guess the "novelty" of a female singing the opening theme to Pokémon has worn off for TPCI. The American theme song is, in no way, attempting to be a translation of the Japanese theme song. It's just its own song doing its own thing. So instead of doing a line-by-line comparison between it and a song it's not even trying to emulate, I think it'll be more useful to look at each song individually and go from there. The lyrics on the left are my translation of Saikoh Everyday! The original Japanese lyrics can be found here. The lyrics to the English theme song are on the right. Come on, rise up and sail with the wind! It's great, it's great, it's great - let's go! But wow-ow! We'll be OK.
Having the courage and willing to try! And we will carry on! As you can see, the Japanese song is telling us how trying your best is this great, wonderful feeling. It lets us know that even if we falter, we can still pick ourselves up and continue to strive to be the best. I particularly like the parts that say "Go all out, change yourself, and do your best - / Everyone advances everyday" and "Friendship, love, and guts - / We're evolving everyday" because they're really unique ways to let us know that no matter what happens, we can grow from it. The latter part of the song seems to focus more on the relationship between trainer and pokemon and how everything will be OK since they're together. The English has a lot of the same themes, but it goes about delivering them in some of the most hamfisted ways. Why let the audience figure out what the song is about when you could literally just directly tell them instead? It's about you, it's about me, and it's about every cliché you can find about wanting to be your best. I also manages to shoehorn the words "Pokémon" and "Sinnoh League Victors" because apparently, the song wasn't awkward enough. The English song is also a lot slower than what we're used to. I wonder how that decision came along. 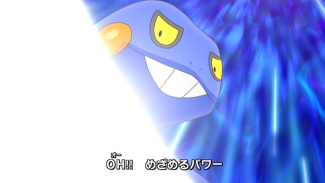 It almost seems like TPCI heard the complaints fans made about the Japanese opening being so peppy and upbeat that they overcompensated for it by making their song as slow and lethargic as possible. This may have been an alright theme to place in the middle of a region, but for an opening that's supposed to get the audience pumped for the upcoming battles, it fails miserably. 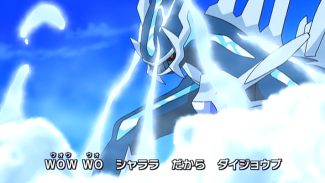 Continuing the tradition started with DP Battle Dimension, TPCI has translated the opening credits and displayed them during the opening animation. Here are all the credits as presented in the Japanese version. English translations are on the right. East Japan Marketing and Communications, Inc. 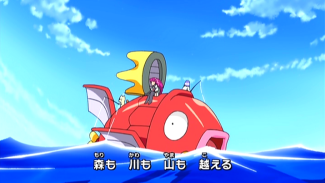 The English dub more or less translates the credits as shown in the Japanese opening, with the usual omissions. Missing is the opening text about Satoshi's and Hikari's adventures, the information about the franchise's publication, the involvement of TV-Tokyo Music and East Japan Marketing and Communications, Inc., and the data about the opening theme. In addition, the credits for "Producers" are different, just like they were last time; the Japanese opening lists Sasaki Ryou (TV-Tokyo) and Tanaka Shigehiro, while the English opening lists Odahara Akiko (TV-Tokyo) and Tsuduki Hiroshi under those positions. The opening credits are displayed in the same order in both versions. In the Japanese opening, the credits are displayed in various positions depending on the empty space available in any given scene while in the English version, they're all displayed on the bottom left-hand corner of the screen. The English version places the Japanese names in Western order - given name followed by family name - instead of the original Japanese order. The opening theme to the American version clocks in at about thirty-nine seconds, nearly a full minute shorter than Saikoh Everyday! So, some things had to be removed to make everything fit. Below are screenshots of the images that were not shown, in any way, shape, or form, in the English dub. The very first shot of the opening is one of Hou'ou's eye. This solo shot of Hou'ou is removed. We do get to see the shot of Satoshi running after it that immediately follows, however. Pikachu vs. Lucario. 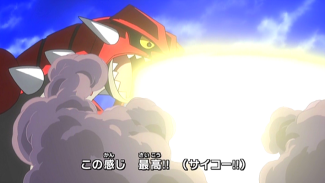 The shot of Pikachu using Iron Tail during this sequence is used in the dub opening. 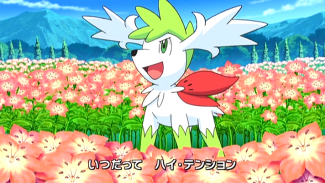 The only one of Takeshi's pokemon to get a screen to itself gets cut. 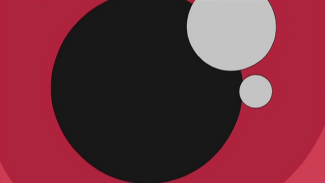 Takeshi's big role in the opening is removed. 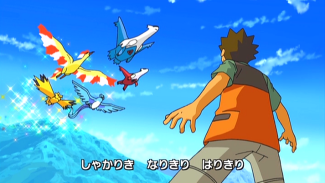 The three Kanto birds flying overhead are kept, but Latios and Latias are not. 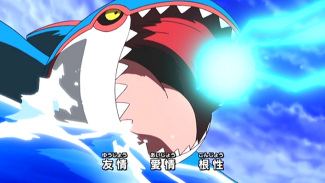 The Rocket-Dan are just minding their own business when Kyogre jumps out of the water and shoots them off into space. People are convinced that Satoshi and his friends are singing along to the opening theme during this part. I don't think they are. We've seen those flowers before. 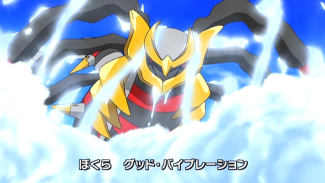 Palkia emerges from the clouds. I really like the way the clouds cling to their bodies like that. I think that, overall, this opening fared a lot better than the others as far as retaining the most amount of footage goes. You'd think that a three-way battle with Kyogre, Groudon, and Lugia would have made the cut, but the whole thing pretty much got removed. It also looks like TPCI doesn't really care about Brock - all of his scenes got axed. I can't say I'm surprised by the lack of Shami stuff because it's all "too boring" for an American opening. Amazingly, the dub resists the urge to use clips from TV episodes for the first time ever. And hey, what do you know; we get more of the higher quality opening animation intact as a result! It's kind of irksome that it took the dub fourteen tries to finally come to this realization, but better late than never, huh? I hope this is a sign that the practice of awkwardly slicing in unrelated episode clips into opening themes is a thing of a past and that we can look forward to openings composed of nothing but opening animation clips from here on out. The big things I'll remember about the English version is how slow the song is and how there are no episode clips present. While I don't think the song used for the English version is fitting, I do find the editing of the clips to be competent enough to give off that same climatic feeling we get from the Japanese version. 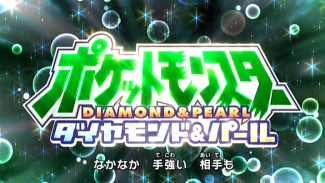 Whether you love it or hate it, the song will only be around for about 40 episodes, tops, before the start of Pocket Monsters Best Wishes necessitates an all-new opening. Will the next opening be able to get us pumped up for the new region? Only time will tell!